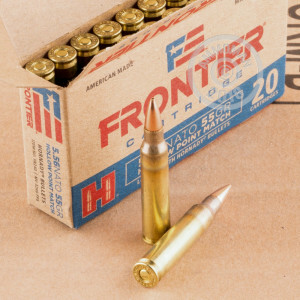 This 5.56x45 cartridge from Hornady’s Frontier line of ammunition sports a 55 grain projectile. The match grade bullet is exceedingly accurate and suitable for competition as well as seeing just how finely tuned your rifle is, and because it has a hollow point it will inflict pronounced damage on soft targets as well. Hornady has crafted this round with their industry’s most cutting edge techniques and technology. It is not only assembled according to the same method employed by the US military, but also features a military grade Boxer primer and propellant along with a reloadable brass casing. Hornady’s intense quality assurance protocol has ensured that this round is poised to deliver reliable and consistent results. 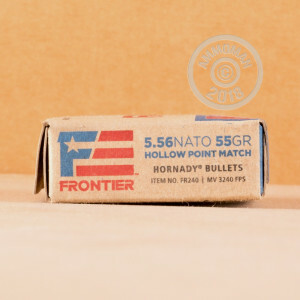 With 500 of these versatile, American-made, and military grade rounds at your disposal, you’ll be very satisfied at the range or in any other situation you would save their implementation for. Order now and receive free shipping and handling on your order!